Here is a quick update for July as there is a lot going on at the moment. 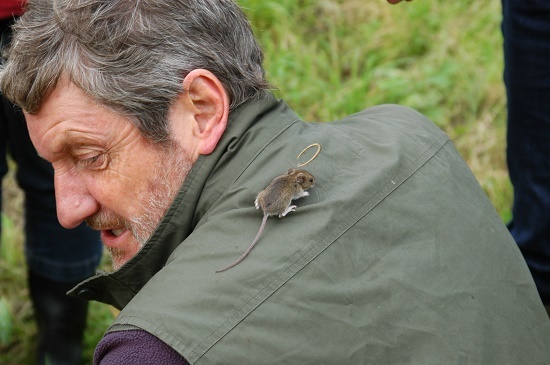 Ten of us joined Ian and Hillary Bedford on Sunday morning to see what small mammals are living on the field. 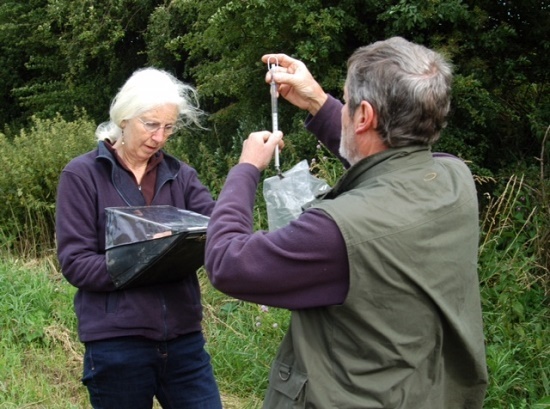 The previous day they had set 60 traps at various points along all 4 edges of the field.The traps were filled with bedding and food, and positioned carefully to ensure they didn't get too hot or cold,so that any mammal caught wouldn't suffer. 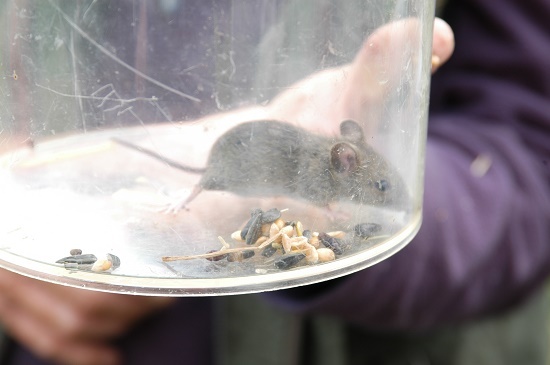 We were excited to find 7 wood mice, 3 bank voles and 3 shrews during the morning.We were taught to identify our catches by looking at tail length, eye size and ear size. Each trap was picked up, checked to see if the door had been triggered to shut, and carefully emptied into a clear plastic bag. 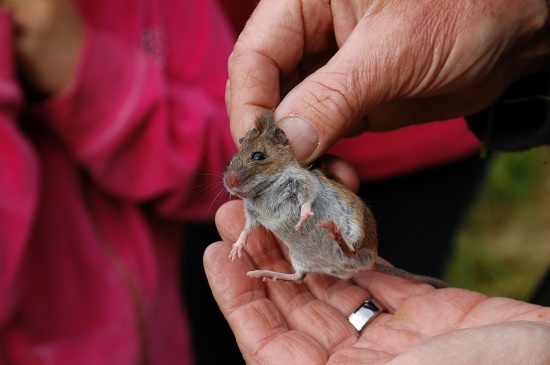 Any mammal caught could then be identified, weighed, carefully picked up by the scruff of the neck (which is pain free) and checked over. They were then let go next to where the trap was so that they could find their way home. We found a mixture of males and females, some pregnant, and some youngsters. We found most mammals along the hedgerow by the road, and along the Ellerbrook. 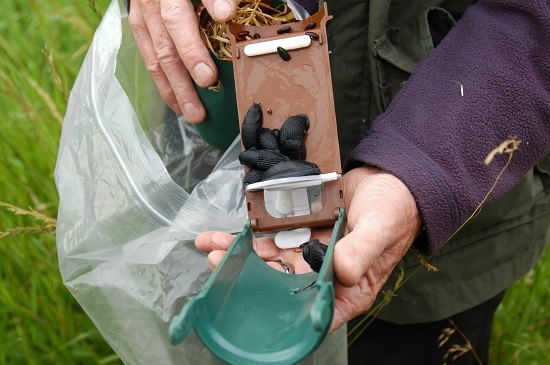 Unfortunately many of the traps had been triggered by large black slugs. This type are carnivorous and had been attracted to the fly pupae used as a bait for voles. This type of slug eat the vegetable munching pale slugs, so we are happy to have them. Those who wanted had a chance to open traps, handle the mammals and let them go, so it was a great experience. Our Broad Beans are doing really well and we have sown them sequentially so they should be around for a while. This really is such a 'giving' crop and they are very nutritious so I make on apologies for their frequent inclusion in the veg box. Here are a couple of things you could do with them. Please send in some of your favorite recipes. Broad Beans freeze really well. Okay you may get a bit fed up of them in the summer but if you follow these instructions for freezing they make an easy veg to add to any winter dish. The blanching method ensures that they taste as fresh out of the freezer as they do straight from the pod. Podded and rinsed broad beans. A large pan of rapidly boiling water with a metal basket that fits inside it (like a chip pan basket). A large bowl of iced water. Heat the metal basket in the water before the beans are added. Put the beans into the basket, bring back to the boil and time for 3 minutes. Plunge the beans into the bowl of iced water for 3 minutes. Drain thoroughly in a colander then mop dry on kitchen paper, pack and freeze. The beans can be cooked from frozen by putting them in a pan of boiling water, cover and cook until tender. A Recipe for your Broad Beans (which can be made with broad beans you have frozen too) taken from: The Boxing Clever Cookbook by Jacqui Jones & Joan Wilmot (J&J Publishing). This is a really good book that has been specially written for people who have random veg that turn up on their doorstep that they have no idea what to do with. We bought ours secondhand on Amazon and it was well worth the few pounds it cost. If using frozen broad beans, allow them to defrost. If using fresh pod them. Heat the oil in a frying pan, add the onion and cook for 3-4 minutes until softened. Add the beans, orange juice and most of the rind and 6 tbsp water. Cover and simmer gently for about 20 minutes until the beans are tender. Transfer the mixture to a food processor or blender and add the yogurt and mint. I thought it would be worth a reminder that all veg should be washed before consumption. We do our best to keep things clean on the farm but we don't have great washing facilities on site so always give things a good wash before eating. 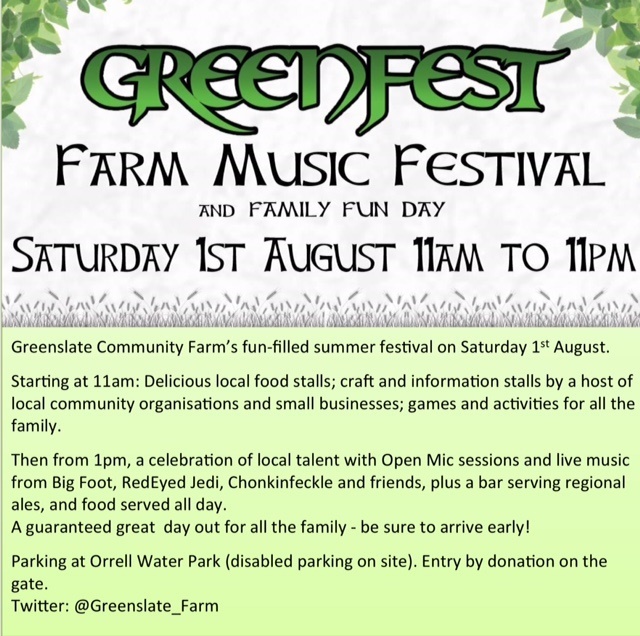 I have been asked to pass on details for an event taking place at Greenslate Farm in Billinge this Saturday. We have now been contacted by the Canals and Rivers Trust who have offered to get some volunteers together this Sunday to attack the rest of the balsam growing on the canal bank side of the ditch. I am hoping that if we can also spend some time on this 'two pronged attack' Hopefully we may be able to knock the Himalayan Balsam right back . The plant is an annual so it grows from seed each year. In addition, the seeds have a life of only 2 years so we should have a well diminished stock of seedlings to deal with next season and perhaps erradicate it by the year after. could be planted -- wreaking even more havoc on our bees. dangerous these chemicals are to bees and other pollinators. back down and protect bees. 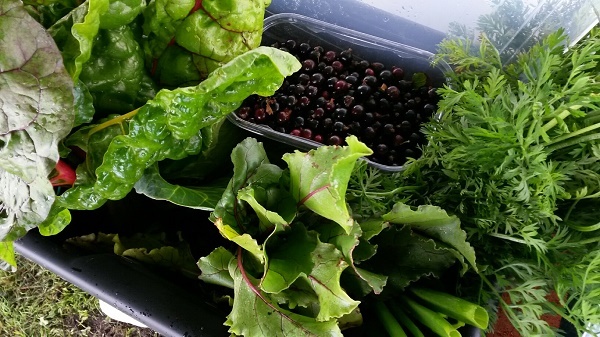 ...we have had: Potatoes, Broad Beans, Mange Tout Peas, Beetroot, Fresh Garlic, Carrots, Rainbow Chard, Sweetheart Cabbage, Spring Onions and Blackcurrants. Brilliant value at £5 or £10 (small or large); ask a friend if they would like to try one. Note, these prices are a special offer for this season whilst we continue to improve our growing skills and range of produce. As the Mange Tout are getting a bit older they can become stringy. Here is a quick way to de-string them. Copyright © 2015 Organic Veg Club, All rights reserved.